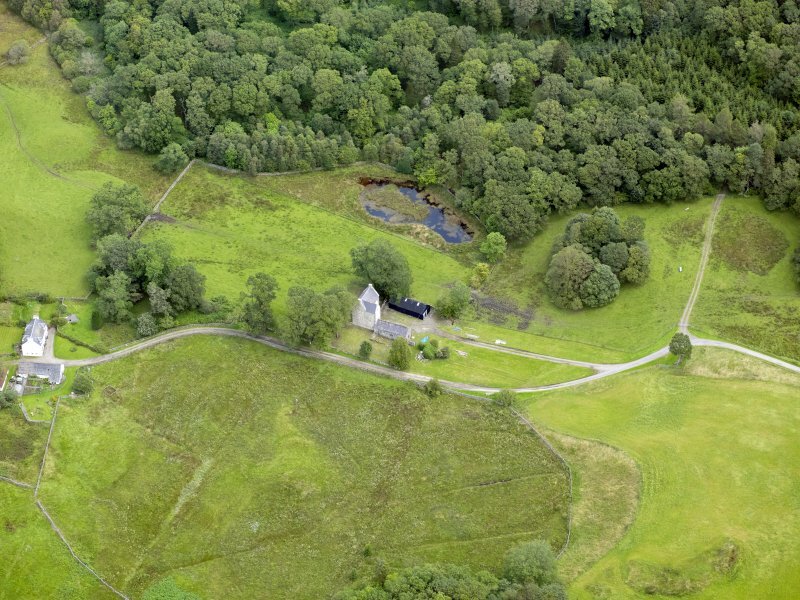 Oblique aerial view of Earlstoun Castle, taken from the SSE. 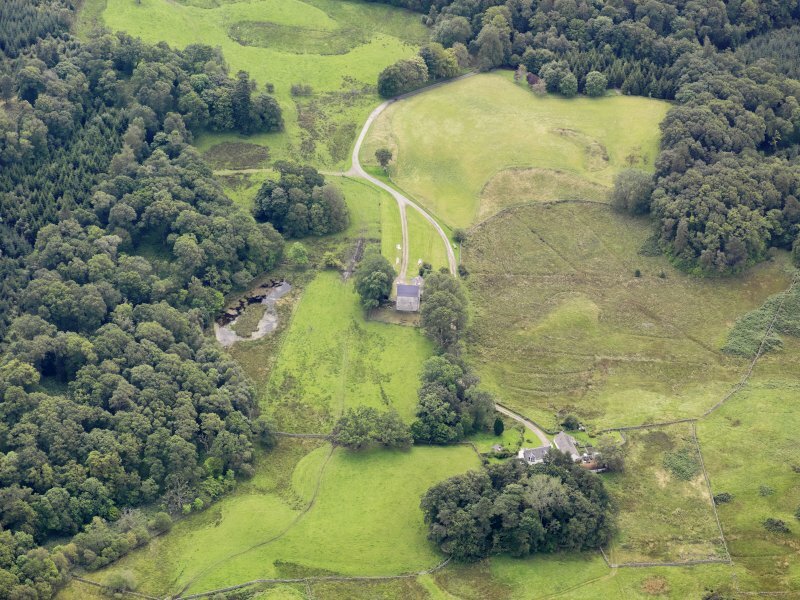 Oblique aerial view of Earlstoun Castle, taken from the NW. 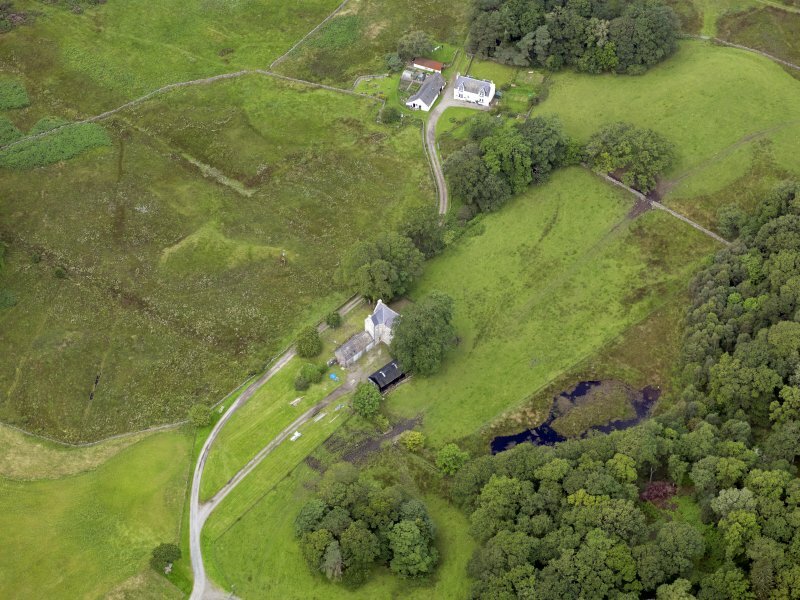 Oblique aerial view of Earlstoun Castle, taken from the SW. 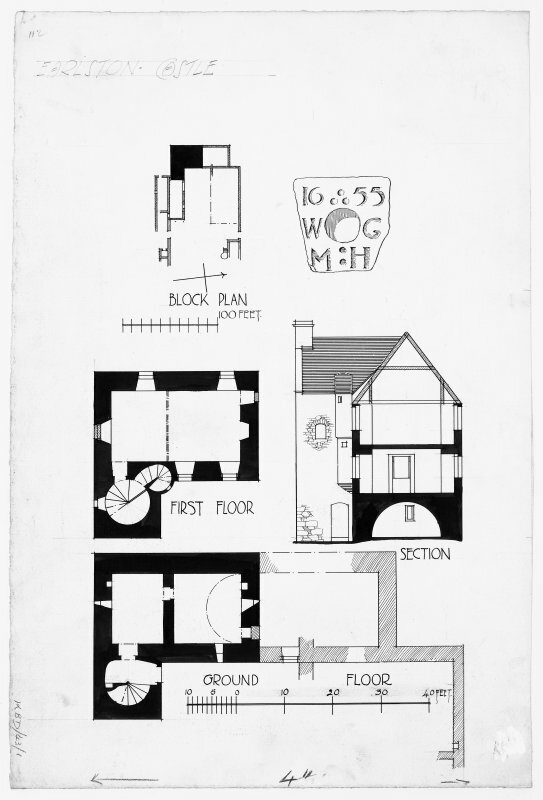 Floor plans, section and sketch of carved stone. Oblique aerial view of Earlstoun Castle, taken from the E.
(NX 6126 8402) Earlstoun Castle (NR). 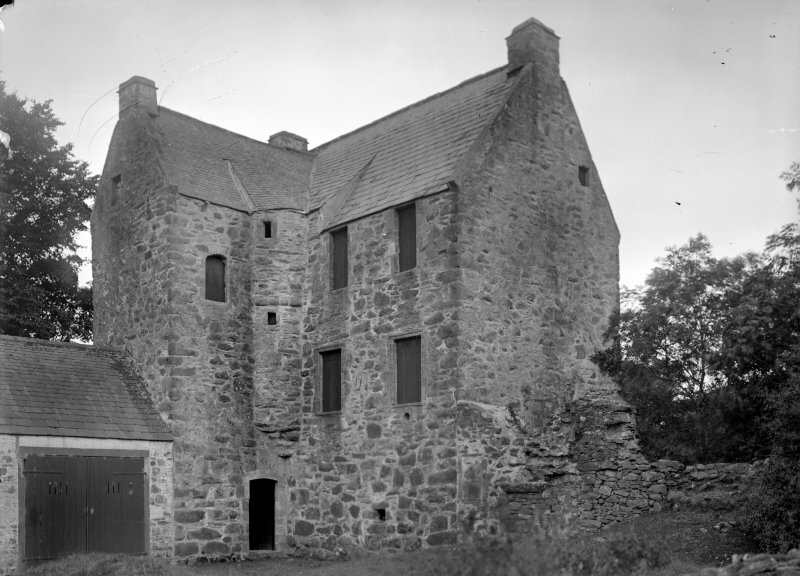 Earlstoun Castle (N Tranter 1965), now in a poor state of repair, is a typical laird's house of late 16th or early 17th century date. It is L-planned, with a main block of three storeys and a garret; the rubble walls are 4ft thick and the gables are not crowstepped. Low extensions have been added at an early date to both gables and curtain walls have enclosed a courtyard, but little of these now remain. Some windows have been enlarged and altered, and beneath a first-floor window on the S side of the main block is a stone dated 1655; this is shown by MacGibbon and Ross (1889) on the E addition, now ruinous, to the erection of which the date apparently refers. In the 16th century Earlstoun belonged to the Sinclairs, passing to the Gordons in the late 16th or early 17th century when this house would be erected, probably on the site of an earlier stronghold. Earlstoun Castle (name verified by Capt Forbes, Earlstoun Lodge, Dalry), is unoccupied and is now part of a group of farm outbuildings. It is in a good state of repair externally and the 1655 datestone and the moulded window frames are well preserved. The "low extensions" are visible as turf-covered footings and parts of the curtain wall are still evident. Surveyed at 1:2500. The castle has now fallen into a state of disrepair and the internal structures are in danger of giving way. The upper floors have collapsed, leaving walls wthout proper lateral ties. The owners now wish to stabilise the structure and reinstate the missing floors. Before this work took place, GUARD undertook a standing building recording. The castle is an L-shaped tower house, built in greywacke rubble with sandstone dressings. The dressings sit proud of the rubble masonry, suggesting that the building was originally harled. The smaller wing of the castle comprises a turnpike stair and turret stair and two rooms. The principal wing has three stories and an attic. The interior walls are of rubble masonry and between 0.6m and 1.2m thick. The ground floor is barrel-vaulted and has two rooms. The first floor runs the entire length of the wing. This was the main hall and has 4 window openings, which have been enlarged at some point. There are still the remains of finely-carved woodwork, including panelling, rails, skirting and a cornice. The interior panelling and design was changed on a number of occasions, including around 1660. The second floor is accessed through the turret stair through a panelled passageway, since destroyed. This floor is divided into two rooms by a timber-panelled partition. There has been much alteration work, including the windows, which have been enlarged. Another window has been filled in with rubble masonry. This floor has remnants of wooden panelling and a plasterwork ceiling. The attic is accessed through the turret stair. A wall in the attic was heightened by 0.45m in order to facilitate the fastening of pendant posts to stabilise the rafters. No flooring in the attic has survived. 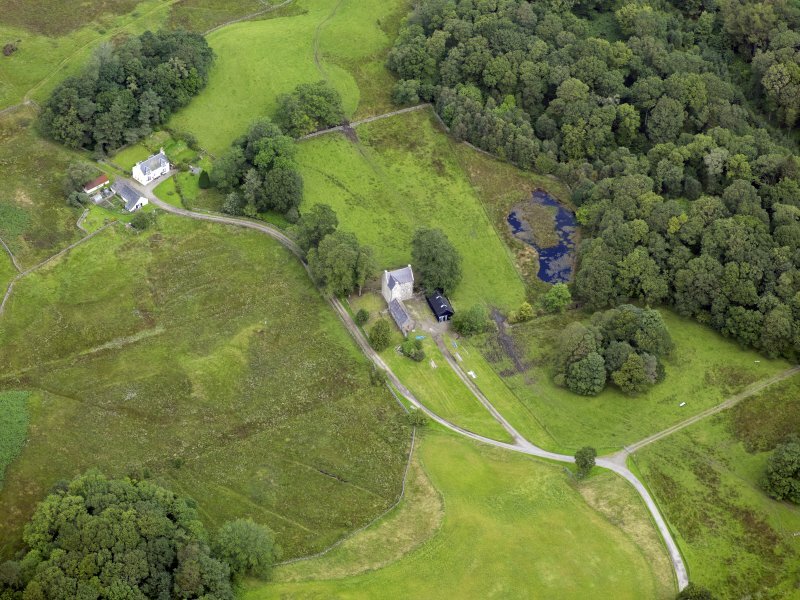 GUARD Archaeology Limited were commissioned by ARP Lorimer to undertake an archaeological watching brief during the installation of services at Earlstoun Castle, St John's Town of Dalry, Dumfries and Galloway (NGR: NX 61268 84022). The work was undertaken between the 7th and 17th March 2011 and revealed no features or artefacts of archaeological significance.